We’re heading away for the weekend and so I thought I’d do a bit of baking to take away with us. 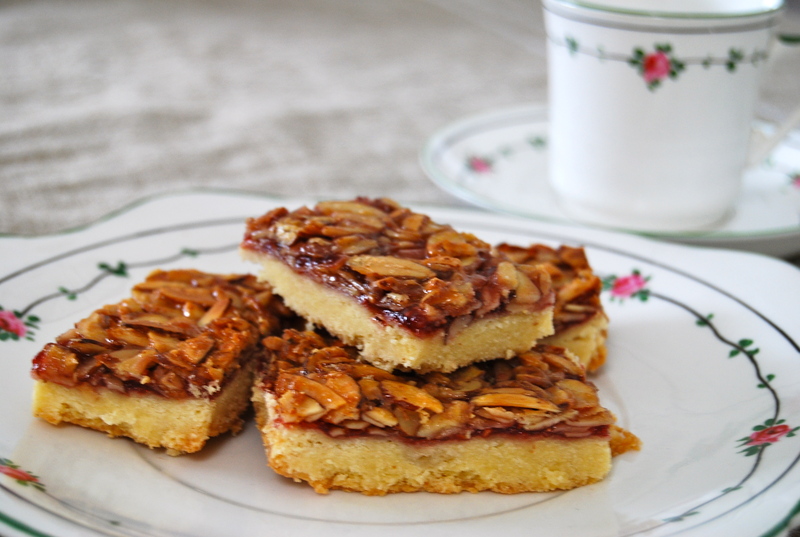 I had copied this Almond and Raspberry Slice recipe out of one of mum’s Bill Granger books a while ago and hadn’t had a chance to try it, but I can now say that it tastes just as delicious as it looks! I have put the recipe below for those that are keen to try it. I didn’t have quite enough almonds in the pantry so I just cut down on the amount of butter for the topping and it seemed to work well. Preheat the oven to 180°C and lightly grease a 24 x 20cm tin and line with baking paper. To make the almond topping, put 60g of the butter, 55g (1/4 Cup) of the sugar, 1 tsp of the vanilla extract, almonds and milk in a saucepan. Cook over a very heat until the butter has melted, then turn off the heat and leave to cool. To make the base, beat together the remaining butter, sugar and vanilla extract until pale and creamy. Sift the flour and cornflour together and add to the butter/sugar mixture in two separate batches, beating on low speak in between until just mixed. Press the dough into the baking tin and bake for 12 minutes, or until lightly golden. Remove from the oven and leave to cool for 10 minutes. Carefully spread the jam over the pastry base, then spread the cooled almond topping over the jam. Return to the oven and bake for a further 25 minutes or until golden brown.